The former HoltraChem plant in Orrington released mercury that could wreak more havoc on the area's fishery. For the opponents of the Searsport dredge project, mercury contamination is the big worry. 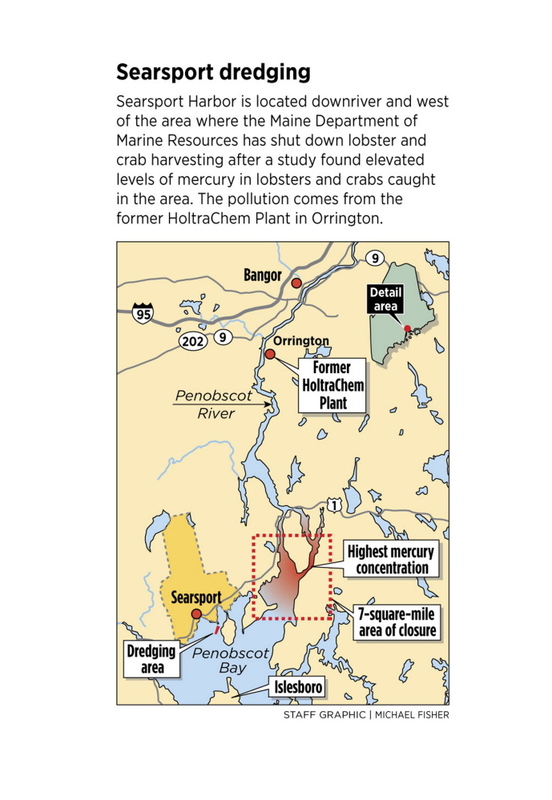 Those concerns deepened in February when the Maine Department of Marine Resources closed seven square miles to lobster and crab fishing after unsafe levels of mercury were found in the lobsters and crabs caught there. The area is upriver from Searsport and closer to the source of the pollution, the former HoltraChem plant in Orrington. Until it stopped operating 14 years ago, the plant used mercury in a process to create chemicals for the pulp and paper industry. For years, the company dumped waste directly into the river and later buried the waste in landfills near the plant. Considering the level of contamination in the river, the Army Corps of Engineers needs to be thorough in the way it tests and analyzes the sediment in the area targeted for dredging, says Kevin Yeager, a sediment geologist who is the federal court-appointed sediment expert for an ongoing lawsuit related to the HoltraChem plant. “The Army Corps of Engineers is dealing with a system that is very well documented to be polluted with some really nasty stuff,” says Yeager, an associate professor at the University of Kentucky. “You don’t want to do something that is good for commerce but has a negative impact on the lobster fishery.” To date, however, all the sediment testing for the dredging project has failed to comply with federal guidelines for such tests, he says, and the Army Corps of Engineers has combined the data in a way that dilutes the results. Yeager examined the agency’s data and concluded in a July 29 report that the sediment in the area to be dredged is “quite contaminated” with mercury and heavy metals. He says more complete testing will likely find greater levels of contamination. The report was funded by groups opposing the project, including Friends of Penobscot Bay, the Sierra Club the Maine Lobstering Union. The area proposed to be dredged was tested for contaminants in 2008. Tim Dugan, a spokesman for the Army Corps of Engineers, says the agency followed the testing protocol mandated by the federal Environmental Protection Agency. He says the results of the tests show the sediment is suitable for ocean disposal in sites off Islesboro and Rockland. He says federal law prohibits dumping sediment in an area that would increase the level of contamination at the site. “If it’s not suitable, it can’t be put there,” he says. Recent revelations about the level of mercury contamination upriver means more samples need to be taken for the dredging project, particularly from areas not examined in 2008, such as the southern end of the dredging area, says Robert Vining, a former Army Corps of Engineers official now working as consultant for Islesboro Island Trust. While the Sears Island causeway appears to direct the flows of the Penobscot River to the east of the harbor, he says, tidal circulation could have brought sediment into the dredging area, he says. If that has happened, the dredge project could disturb a layer of sediment containing inorganic mercury and expose it to bacteria, converting it to methylmercury – a more toxic form of mercury that can build up in predatory fish and move up the food chain, according to Kim Tucker, an attorney and environmental activist who lives on Islesboro. To address concerns of pollution, the state has already asked the Army Corps of Engineers to obtain more core samples from the area proposed for dredging, according to Mark Bergeron, director of the Maine Department of Environmental Protection’s division of land resources regulation. Bergeron says a chemical analysis of the new core samples will be compared with samples the Army Corps of Engineers took in 2008 to determine if there has been any change in mercury levels. Before the end of summer, the Army Corps of Engineers is expected to apply for a water quality certificate from the DEP. The agency will have year to review the application, which must address all of the environmental impacts of the project, according to Bergeron. He says other state agencies, such as the Department of Marine Resources will also weigh in. Tucker, who played a leading role in the defeat last year of a proposal to build a propane terminal at the port, says that she worries that the state will be lobbied by business groups who want to transform Searsport into a “heavy industrial” port without taking the time to assess the risk to the bay’s ecosystem. “They are using Penobscot Bay as a grand chemistry experiment,” she says.